Alvi Technologies announces the availability of the new EA16 touch screen process indicators from Fischer, Germany. Reliable and effective monitoring is important to achieve a high quality end product in any industrial process. Continuous monitoring in real time throughout the process will ensure any problem is identified and resolved immediately instead of leaving it till the end of the process to discover a poor quality product. Process monitoring is, therefore, an important factor in the long-term reliable operation of any automated controlled system. The new Fischer EA16 from Alvi is a process indicator that displays measured values from the transducers. Key features include a 3.5” TFT touch LCD display with configurable colour switching; 2 or 4 channel inputs with 2 or 4 configurable outputs; USB interface with an optional data logger function and data storage on a micro SD card; and PC software allowing all parameters to be flexibly adjusted. 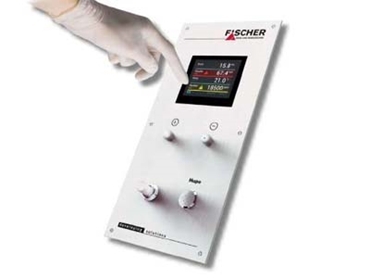 Fischer’s EA16 touch screen process indicator can identify causes of malfunctions instantly and repair them effectively; maximise production rate and process speed with increased quality and greater consistency; minimise downtime and optimise manufacturing processes; and document all processes at every stage for traceability and track-ability.